Here are some pictures of Laura's new bedroom. She has done quite well in her new bed, and we finally got the rocker removed. She was quite attached to our nightly rock, but lately she's been stalling, so it was time for our ritual to be over. 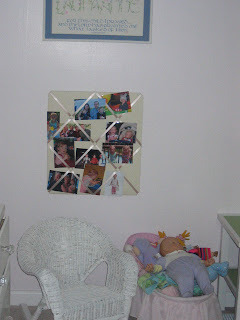 Her room is so sweet and such a great spot for a little girl! How cute! I love her room. Maybe soon I'll be able to decorate a little girl's room! Very cute room. I look forward to the day I get to decorate a big boy room. I already started looking for ideas. Boy do I hope Aidan loves football. really cute! Anna just got her big girl room. ha ha I am littl behind in that! I love it! Great job! I am sure she feels like a queen in it.